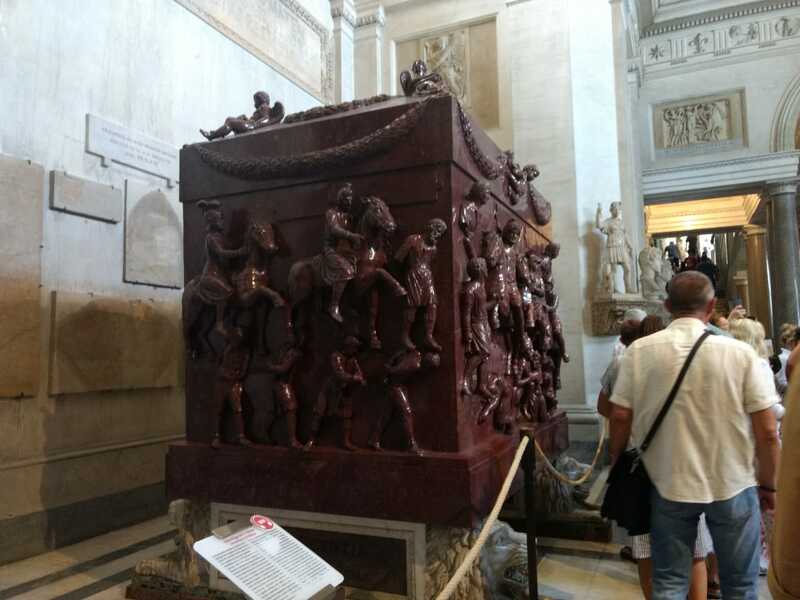 To Rome with love - How Rome swept us off our feet! 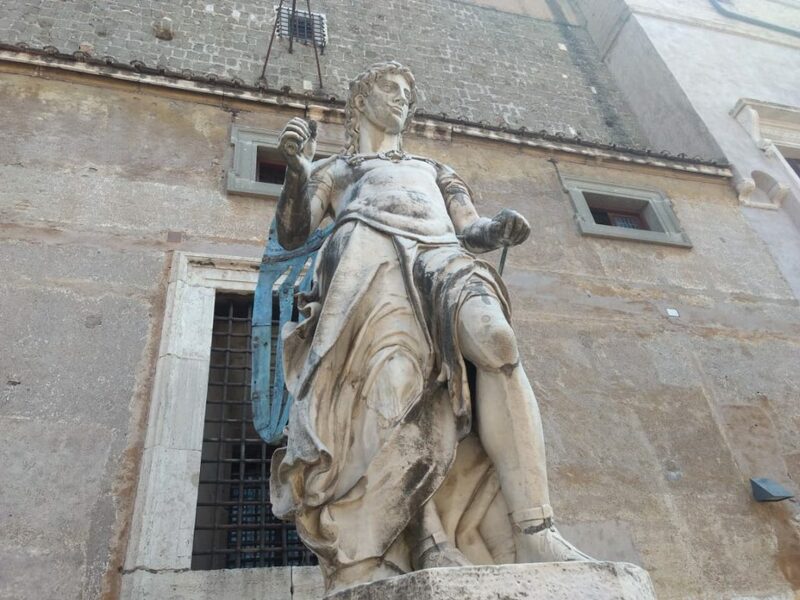 Home » Guest Writers » To Rome with love – How Rome swept us off our feet! 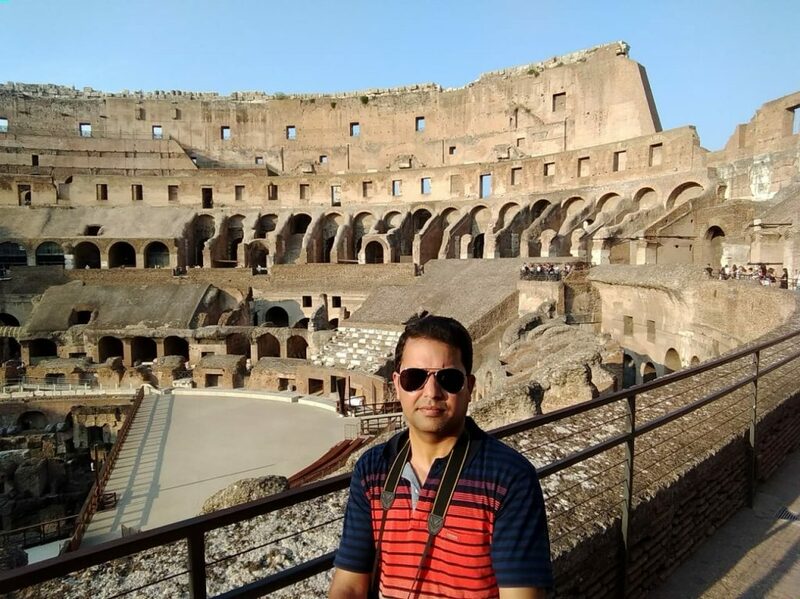 This August, our customer Madhuri went on a trip to Italy with her family and this is a heartfelt story of how they fell in love with Rome. For an Indian who usually travels on the Bangalore roads, any foreign street would appear magical. And to be there in Rome is just magical! You will instantly fall in love with the city and with the people. Italians are quite cheerful. We arrived at the Rome airport in the afternoon. Emirates comparatively have better cooks and thanks to the sandwich we had in-flight, we weren’t hungry when we landed. After learning about the counters, we collected our bags and my baby’s stroller! The airport is not as big as in Dubai or Singapore. 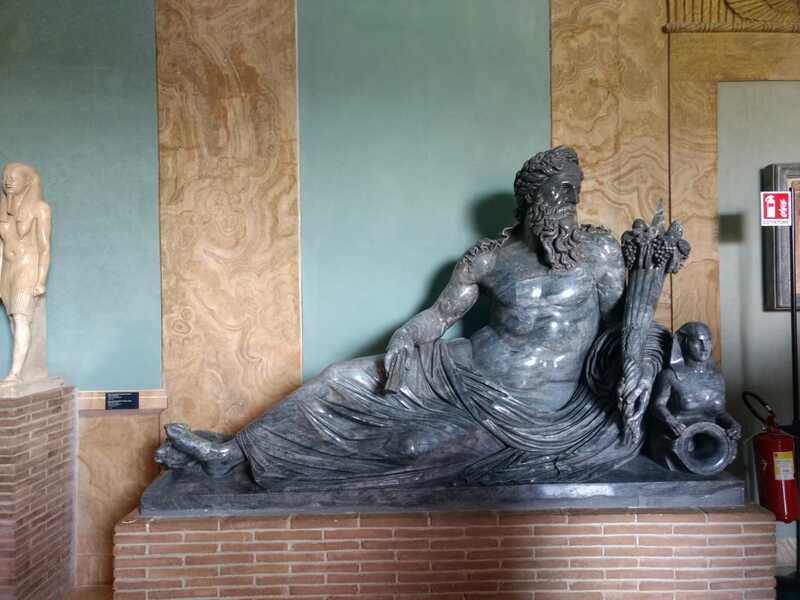 Since we booked the trip through ‘Pickyourtrail’, they had prebooked our Roma pass, which could be used for trains, buses within the city, and offer free entry to a few museums. We collected our Roma pass at a stall near the exit and went on to buy a sim by TIM. It cost us 35 Euros. Because we had just arrived from India, it was a lot of money for us. The sim came with 15 GB data and a limited talk time of 200 mins which we felt was sufficient for our 8 days trip in Italy. Our agent had already booked a taxi to the hotel and the driver was waiting with our name board. It was all easy and we didn’t bother to think which bus/train to catch to go to the hotel, especially after a long flight journey. The drive in Italy is on the left side and the seat belts are mandatory, regardless of where you sit. The taxis in Italy are quite different from ours. They have a huge trunk space, all our bags including baby stroller easily fit into it. The airport is quite far from the city. It’s about 30-40 minutes drive from the city centre. And, that’s okay because we drive 2-3 hours to reach our Bengaluru international airport. The moment we got off the taxi, (didn’t pay anything as it was prebooked) we came to know that our trip is going to be full of ups and downs, like literally! Everywhere, there were steps traversing up & down and roads as well. Our hotel, Palazzo al Velabro was in the city centre and provided easy access to the bus stop and pizzeria. We had a dining hall and a kitchenette, it was like a service apartment. After almost 12-18 hours of journey, we were desperate to fresh up. We had half a day to ourselves to roam around so we asked our receptionist about the nearby restaurants. The guy was very friendly & helpful and advised us to go to a nearby locality. Trust me, instead of Google, consult a local about how to properly see their city. The area he suggested us with was ‘Trastevere’. It was a kilometre away and across the Tiber River. Reminiscence of the 15th century, Trastevere is an old world charm that will take you back to the olden days. Believe me, it was a very beautiful walk. Rome is best explored on foot. Cobblestoned streets, beautiful alleyways, and narrow roads, fringed by old-fashioned medieval buildings are nothing short of magic. Our daughter of 2 years fit perfectly in the stroller. Carrying her is difficult and she can’t walk long distances. So the stroller was a blessing!! 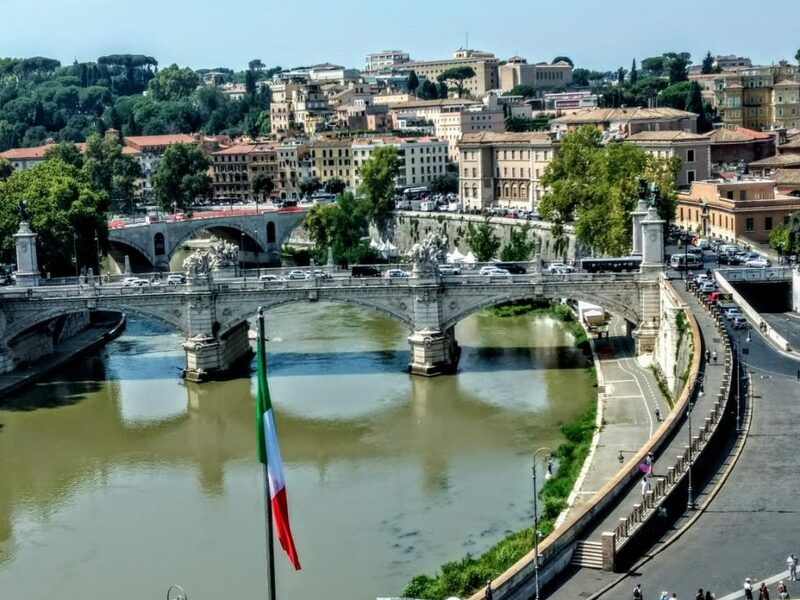 We crossed the bridge across the Tiber River and descended down the stairs. Along the river banks, you will find few cafeterias and hookah bars. My daughter was super hungry and we ordered her favourite dish, french fries. My father & husband ordered beers. For 5 Euros, we got a large quantity of fries. After spending some quality time in the neighbourhood, we headed to a nearby Indian restaurant, Ristorante Indiano Gandhi. The prices are reasonable. The waiter said that they collect table charge, which is 1 Euro per person and recommended us to do a takeaway. So very nice of him. While we were at the restaurant, my husband went to a nearby store to get some fruits for my daughter. You will find a lot of Bangladeshis at local fruit stalls, selling everything from small objects to water bottles and similar stuff. It was 8.30 in the evening, the sun was about to set. We hired a taxi. In general, upon asking the fare, the drivers will give you the average cost. If it suits the budget you can hire. The next morning, we woke up to a bright, sunny day. Summers in Italy are really hot. But we didn’t face any problem as we were used to the hot weather back in India. We had the typical English breakfast in the morning. The list goes like this – bread, butter, different varieties of jam, ham, cakes, croissants, hot chocolate, and my favourite mozzarella. It’s really yummy. The Italian cuisine is popular worldwide. Never search for an Indian restaurant when you are in Italy. Eat Italian when you are in Italy, as you can eat parantha (north India) or sambar rice (south India) the rest of your life. We enquired about the bus that goes to St. Castle Angello. The receptionist advised us to ride bus number 81 and gave us info on where it would stop. The bus stop was very close to the hotel and every bus is numbered & rides on a separate route. There is a display board that shows which bus will come next, stamped with the arrival time. After waiting for 10-15 mins, we hopped on the bus to St. Castle Angello but didn’t know where to get down. Italian buses don’t display the names of the next stop, so it’s a bit difficult to find out where to get down. We tried asking around and the fun part is nobody knew. They actually looked puzzled upon hearing the word. It took time to realize that we have been pronouncing the word wrong and it is actually called ‘Santa Cassello’. One major thing in Italy is apart from a few tourist places and hotels, people don’t actually speak English. Fortunately, we came across our far relative, a Bangladeshi. He understood what were we looking for, guided us really well, and we finally reached ‘santa cassello’ as Italians would call it. And there stood the magnificent castle across the river. PYT had mailed us the tickets voucher, so we easily cut the queue and were about to enter the castle when a security guy came running behind us. We are not supposed to take strollers inside because there are a lot of steps up & down and we couldn’t carry both the baby & the stroller. So, we left the stroller in the locker room near the entrance. The castle has a history of over 1000 years. Some part of it was reconstructed. If you are interested in history, the castle is a must visit. Every stone and pillar has a story to tell & it’s totally worth it. You get a beautiful view of a city on reaching the first floor. It will take a minimum of 2-3 hours to explore the castle. Before stepping inside the castle, we found a small tobacco shop opposite the bridge and they were selling water carton. We hurried! Because it’s water and why not. We paid a euro for a half litre bottle. My husband was more interested to buy water than to visit the castle. Whenever you come across such shops buy a carton of water without a second thought. After our trip to the castle, we were quite exhausted. Just across the castle, you will find few pizzerias. We ordered spaghetti with basil pesto and a mozzarella-topped pizza. It was pretty tasty and the bill was around 20 Euros. After that we hired a taxi to our hotel ‘Palazzo al Velabro’. As usual before hiring the taxi we enquired about the fare and the driver said it would be around 9-10 Euros. Since we were very tired to go by bus, we agreed on the fare and started our drive. Here’s a small story, rather an experience. The driver was a young, carefree but honest person. He appeared drunk, lost his way, and took the longer route. We came to know that he was going in the wrong direction. We said something he said something else and after few exchanges he came to know what we were talking about. The taxi meter showed 15 Euros. But he charged us the exact amount that he mentioned when we boarded the taxi, 10 Euros. Why would we care? We got to see the never-before-witnessed part of Rome in the taxi for free! In the evening, we were set to go to the Colosseum. Since it was just 2-3 Kms from our hotel, we decided to go by walk. Again, we had pre-booked with ‘PYT’ so we could cut the queue. Really a blessing! Because of the popularity, Italy attracts the crowd from all over the globe. Security check again and this time there weren’t any lockers. We had a mini stroller which had water bottles, baby food, diapers, camera, selfie stick and a few other things. Maybe, they would have allowed the camera and the bag pack but the stroller and a few other items weren’t allowed. 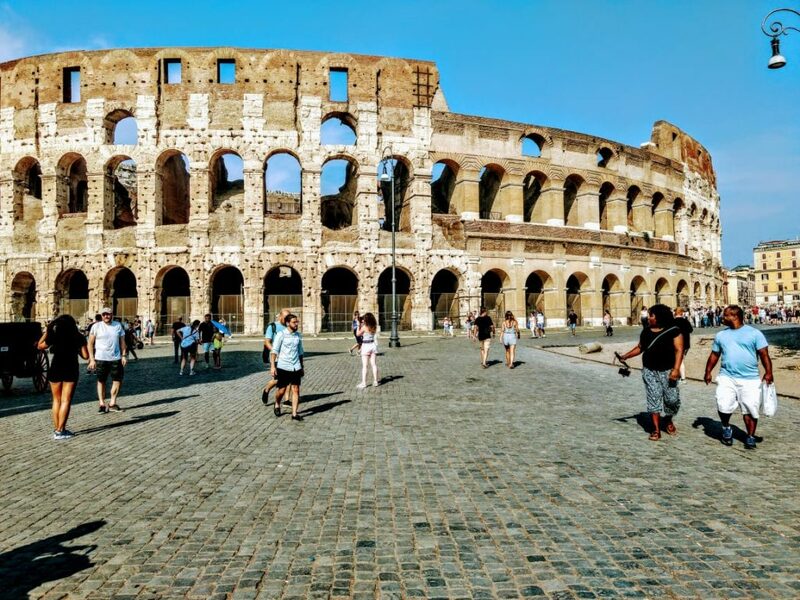 So, my husband waited along with the stroller while I, my father and daughter completed our much awaited Colosseum trip. There’s not much walking to do and it might take 30-40 minutes to watch it, unlike the museums which require 2-3 hours. We just kept staring at those fallen walls and broken bricks. It sure does take you back to those days, I mean around 1000 years back. It’s really amazing to see something which is 1000 years old. Vatican City – here we come! We boarded the bus and used our Roma pass and got down at the bus stop near our hotel. It was around 7.30 or 8 in the evening. The sun was about to set. Perfect time to grab a bottle of wine or beer after a long day. There was a small pizzeria near our hotel, men ordered beers while I was looking at vegetarian cuisine. Sadly, Spaghetti was the only vegetarian food they had. After dinner, we went to the bed early so we could start early to the Vatican City, the next day. We were supposed to reach there as early as possible because it is always crowded and summer vacations add to the crowd. So, the next morning we got ready. Since we were going to the church, we were all dressed up to cover our knees and shoulders. I had earlier read about visitors having to dress appropriately (no shorts and sleeveless). We hired a taxi to the Vatican Museum. Since Pickyourtrail had pre-booked our entry tickets, we could just show the vouchers and enter. As we were about to enter, a Bangladeshi stopped us. He was trying hard to sell the tickets which we already had. He just didn’t stop and went on & on. 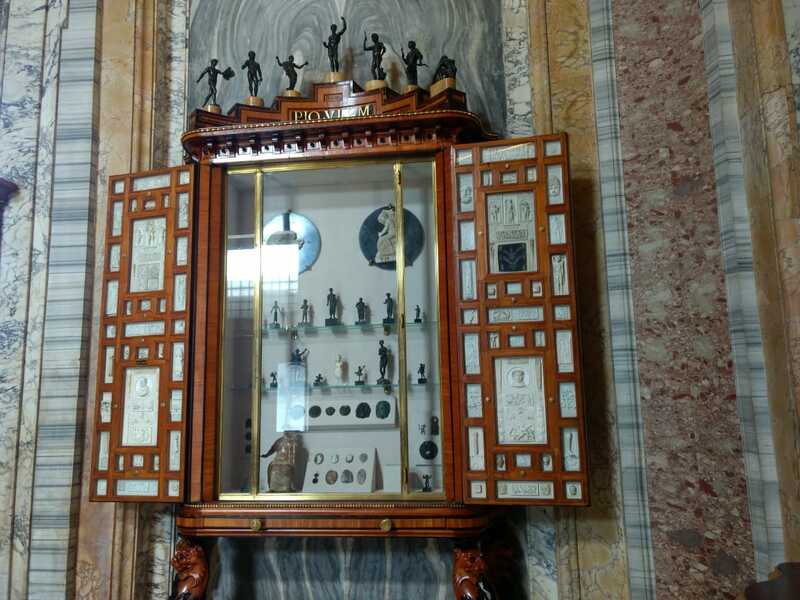 He offered another package for 20-25 Euro per head and that he would help us see the museum in the shortest way possible! We were skeptical and didn’t entertain him. He started like, you have a baby and it’s very difficult for you to explore all by yourselves and silly things like that. For one moment I wanted to believe him but he suddenly reduced the package price from 20 Euros to 15 Euros and said he did that because he thought Indians are like his brothers! Now, we weren’t doubtful but clear that this guy is a waste of time and money. We also advise you to be aware of such agents. There is no need to hire such guides, they are not authentic. So, we firmly said ‘no’ to him and entered the museum. We produced our Pickyourtrail vouchers at the counter and went through the security checks, they allowed the baby food and the stroller. We also had another stroller that had extra few things which they didn’t allow. They issued us token which upon producing would get our bags back. 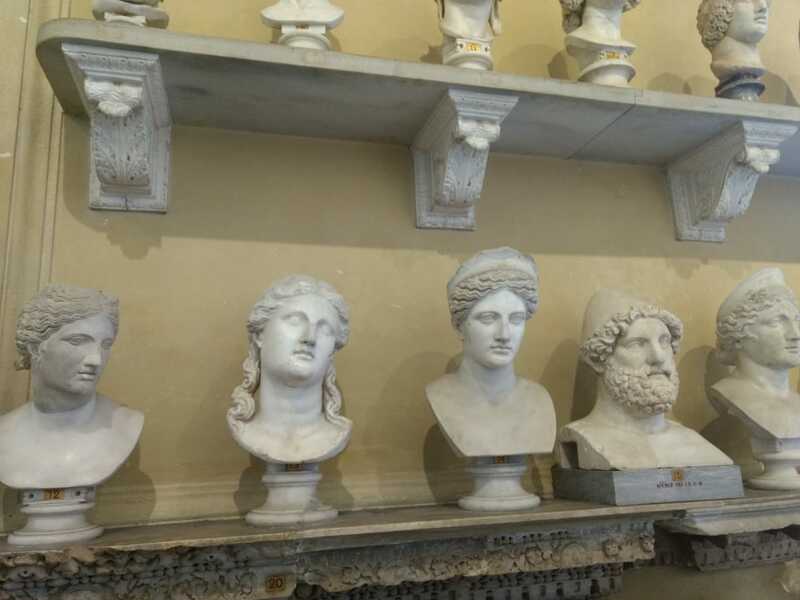 So, tickets were verified, our extra bags were checked-in at the security deposit, and we were all set to explore the Vatican museum. Every time, we hear the word ‘Vatican’, it reminds us of our history books from our school days. Not only does it have a rich history but it is a mystery in itself! 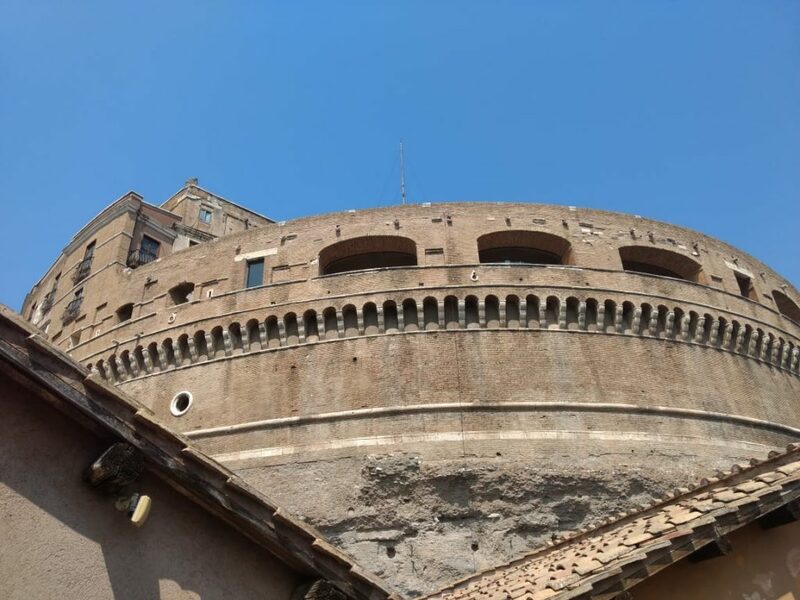 The country which lies within the Rome city has a population of less than 5,000 and is home to the pope. 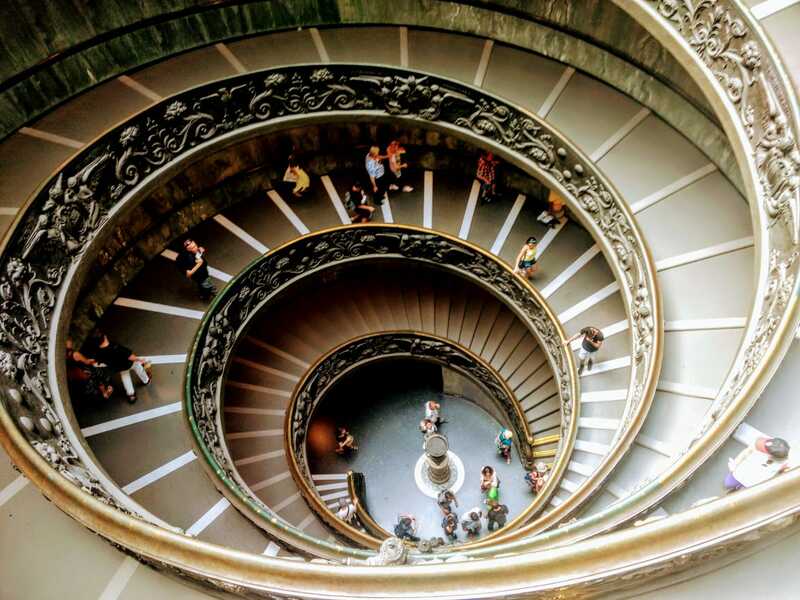 While there are so many attractions to see, Sistine Chapel and Vatican Museums are definitely amongst the top. 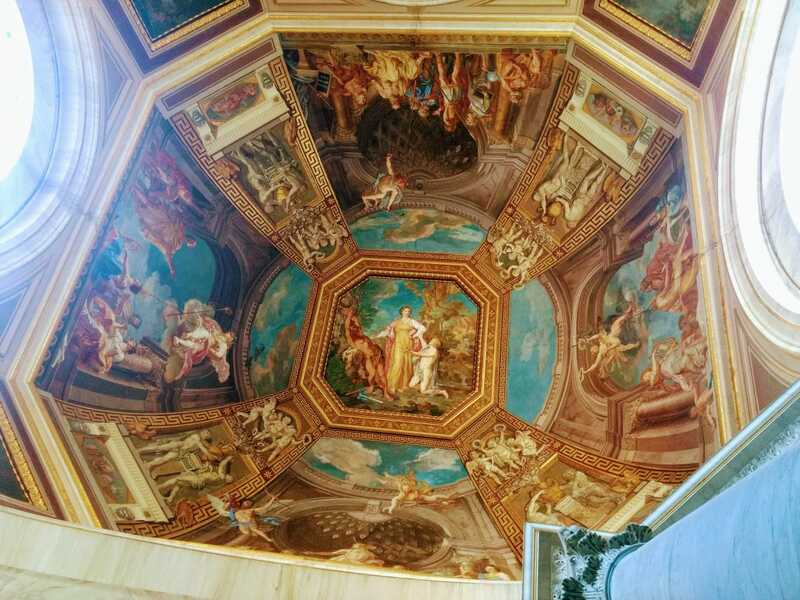 For those who don’t know, Sistine Chapel is the largest Catholic church in the world and the collection of Vatican museums are the largest in the world. It takes months to explore them, 4-5 days to just glance at all the paintings & the monuments briefly. But with that summer crowd and an overactive kid, we had no option but to cover it in 4-5 hours. The paintings and the monuments here are centuries old and so beautiful that they will take your breath away. And, it’s difficult and unfair to describe its beauty in words. Just go there, experience the place, and bring back the memories. We watched the paintings come to life, touched the monuments (check before, if you are allowed to touch) and we could feel the presence of the artists who have poured their hearts out onto the paintings and monuments! We collected our bag from the security deposit and arrived at the exit. We found a Caravan selling snacks. Just what we needed! We ordered a double scoop Gelato and a vegetarian sandwich. So now we had our quick lunch, there is still a half day left, and we were super tired. We were just wondering what to do next and voila! We found a hop-on-hop-off bus. We learnt that for €12 per person, they would cover all the major attractions and it would take an hour. It was a good idea to give some rest to our legs while we see the city. So, we hopped on quickly to gaze at the beautiful city of Rome. Mesmerized by the journey we hoped that the journey of cobblestoned streets, medieval buildings, and clear skies will never end but unfortunately all beautiful things come to an end. Our bus dropped us at Saint Peter’s square which is just beside the museum. We walked around Saint Peter’s square, observed the beautiful architectural buildings, and then headed back. On the way back, we found few water taps and were quick to refill our bottles. Not to forget there was a queue for that. The square is crowded with shops and one can buy gifts & souvenirs from here. There were also tobacco shops, referred to as Tabaccheria in Italy. We bought some beer here. We hired a taxi to our hotel afterwards and as usual, we again enquired the taxi fare before getting in. As soon as we reached the hotel, we all got a quick nap and were up for some more sightseeing. We had a couple of things on mind, like the Trevi fountain and the Spanish steps. We just wanted to spend some quality time with the city but as they would again consume energy and be super crowded we skipped it. We took the offbeat path instead and started walking down any street we felt like walking. After walking some distance, we found a square (you’ll find such squares every few kilometres). My daughter was sleeping peacefully in her stroller. We just sat on the steps and started to gaze at our surrounding. It looked like a beautiful painting. The sun was about to set, the sky was golden, and the breeze was cool. I just wanted to sit there forever, staring at nothing! We then rode on the tram to the same Jaipur restaurant and ordered some rice. We kept it light because we had a train to catch the next morning to Florence. This is not the end! 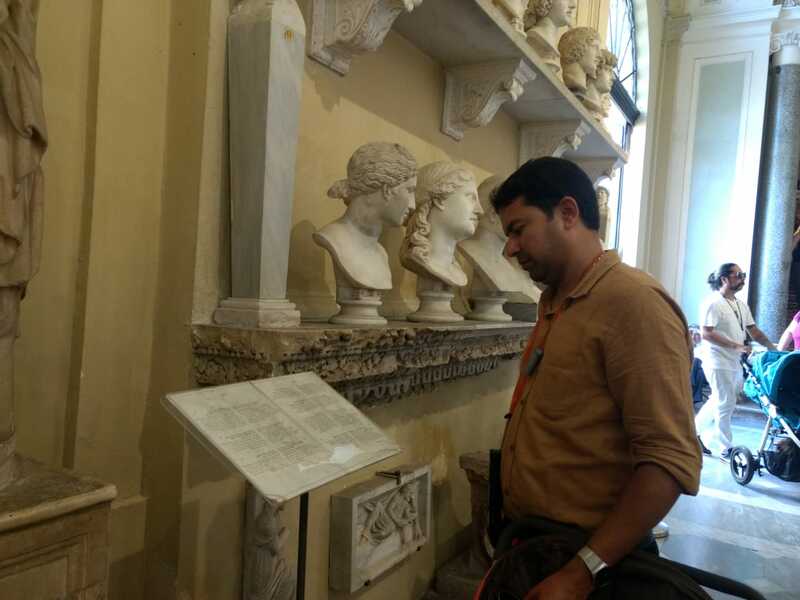 Stay tuned to read about Madhuri’s experience in Florence and Venice. Fell in love with Rome? Plan a trip now! Sitting in public places could earn you a fine of Rs.42000 in Venice, here’s why.